Benozzo Gozzoli at San Gimignano: an exhibition devoted to the great early Renaissance artist celebrates the historic link between Florence and this tiny Tuscan town. Florentine painter Benozzo Gozzoli (1420 –1497) one of the most representative and prolific Italian artists of the 15th Century, and is best known for his Journey of the Magi in Florence’s Palazzo Medici Riccardi. The exhibition, Benozzo Gozzoli a San Gimignano, highlights, for the first time, the four years the artist spent in San Gimignano, one of the most intense and productive periods of his career. Curated by Gerardo de Simone and Cristina Borgioli, the event is supported by the Comune di San Gimignano and the Soprintendenza Belle Arti e Paesaggio of Siena. It features a complete collection of paintings from the artist’s stay in San Gimignano, complemented by documents and textiles. The protagonist of the retrospective is undoubtedly Benozzo’s Madonna and Child Enthroned with Saints John the Baptist, Mary Magdalene, Augustine and Martha (1466). This altarpiece illustrates Gozzoli’s ability to depict rich and precious fabrics. It is this focus on decorative detail, combined with a strong knowledge of realism and an interest in nature, which characterises his style. In 1464, Gozzoli received a commission from Fra Domenico Strambi to paint a cycle of frescoes for the main chapel of the Church of St. Augustine in San Gimignano. Escaping the plague in Florence, he moved to the hilltop town to carry out this considerable work, where he remained until 1467. During this time, he took on a series of other engagements, which mainly consisted of frescoes but also included panel paintings, most of which are, fortunately, still preserved today. The town’s priors also commissioned the artist to restore the Majesty, a fresco painted in 1317 by Lippo Memmi in San Gimignano’s Town Hall. The exhibition not only represents an opportunity to celebrate the artistic heritage of San Gimignano and the legacy that great artists like Gozzoli have left there, but also an invitation to pause and reflect on the link between this tiny turreted town and its larger neighbour, Florence. 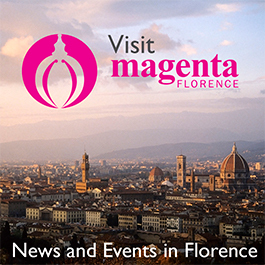 As his native city, Florence held great significance for the artist. It is there that Gozzoli painted arguably his most prestigious work, namely the decoration of the entire Magi Chapel in the Medici Palace. 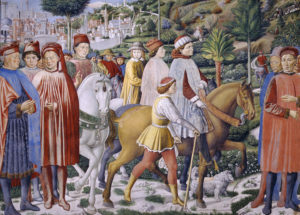 These famous fresco cycles, including The Procession of the Magi, have become an icon of Florence and the Renaissance. From murals in Florence to frescoes in San Gimignano, this exhibition aims to celebrate the achievements of this great artist, reinforce the relationship between these two cities and promote the important artistic patronage of San Gimignano.